‘Insurance’, like ‘fat free’, isn’t always what it appears to be. Ingredients can be substituted, omitted or added without garnering too much attention. We only realize our oversight when our jeans don’t fit anymore, or we're forced to deal with a claim. Understandably, people assume that ‘Insured' holds the company accountable for full replacement value of anything that is damaged or broken irreparably during a move, regardless of the items value. Unfortunately, this isn’t usually the case, and often, the value of compensation is calculated using weight: $0.60 - $1.00 for every pound. And so, if a mover were to accidentally drop your TV and break it, you would receive between $30 and $50. You may not find out how limited the insurance is until you're handed documents to sign minutes before your move begins or worse, after the damages occur. - not fair if you ask us! In the interest of transparency, I have included a detailed description of the services and limitations that we have here at Go Truck Go. Our hope is that it will make it easier for you to chose a company that suits not just your requirements, but your expectations as well. In Vancouver today, the average price of two movers and a moving truck ranges from $90/hr to $150/hr; at Go Truck Go we charge between $89-$105 for the equivalent service, placing us more on the budget side of the average price range. The disparity in cost, is often congruent with the level of coverage, and so, customers moving expensive, high-risk items should expect to pay more for comprehensive coverage. If you find a company that you like, but aren’t convinced by their coverage, then you could always consider using a third party insurance company. That combination often works out cheaper than using one of the more expensive companies. It is worth noting at this point, some homeowner and tenant insurance policies also cover moving damages, so check with your policy provider. If you feel like you require additional coverage you could go with a 3rd party insurance provider like the ones listed below. How much would you compensate me if this was damaged? What would the deductible be if I were to make a claim? Is Go Truck Go the right company for me? Our purpose is to provide a high quality moving service that is both accountable and affordable. Since our core clientele doesn't typically require extended insurance we have opted for a pricing structure and coverage limits that best reflect their requirements. Please find details at the bottom of this page. We would consider ourselves the most safe, experienced, reliable, and transparent of all the budget to mid-range movers in the Vancouver area. On top of our higher then average wages, every one of our movers receives an incentivized monthly bonus based on his performance and customer feedback; the intention is to reward them for good practice, rather than punishing them for accidents. That being said, on the rare occasion that damage is incurred, they are held partly accountable for the cost of reparations. This has proved to be an effective tool for building a team that is not just careful, but loyal and trustworthy. We are ‘fully licensed’, and meet all legal insurance requirements for BC. This includes damage to a single item, usually furniture, caused by the item being mishandled by the movers. These are generally covered out of pocket by the moving company. 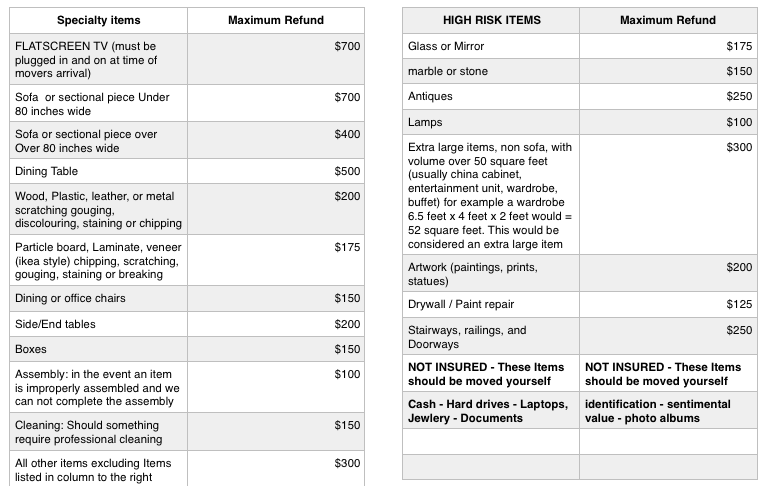 In most incidents, except in the case of some “high risk items” listed below, our limits will cover the cost of professional repair* and in some cases, replacement of the item. However, there are limits to our compensation, so please familiarize yourself with them to determine if you require additional coverage. Repair*: Most standard household items can be repaired to 'almost new’, which is a subjective term, but could be loosely defined as “damage can only really be detected from close inspection’. If a repair to ‘almost new’ condition would be inadequate for you, then definitely consider third party replacement value insurance coverage. Our movers are good, but we can not control the laws of physics. On occasion clients ask us to move items through access ways that are spatially impossible and would inevitably result in contact with walls etc. In these cases there there is no coverage. This pertains mostly to large sofas and some spring boxes up tight stairways. In the case that your item qualifies for multiple categories, the lower limit will apply. At our discretion we will either take the item to be repaired ourselves, or compensate you the amount of the repair - up to the maximum limit listed above. Feel free to send us photos or questions regarding any items that you are unsure about.